Many elements of Middle Eastern cuisine have become solidly mainstream including pita, hummus, falafel, chickpeas, kebabs, baklava, yogurt, honey, pistachios, feta—the list goes on. Other dishes and elements have enjoyed significant focus over the past few years such as shakshuka, shawarma and ancient grains. That said, Middle Eastern cuisine does not come without some baggage, which has slowed its growth as a global cuisine in the U.S. Chief among these issues is the often negative, conflict-filled news American consumers are exposed to. Thankfully, consumers seem to be looking past this to explore and experience the amazing flavors and dishes that come from this culturally rich region. Of course, it’s important to understand there is no cuisine common to the entire Middle East, which is made up of almost 20 countries, though from a flavor-theme perspective, you can expand that further afield to include countries in North Africa and farther east into Afghanistan and Pakistan. The culinary differences country-by-country, and even region-by-region within some of those countries, will be more important in American menu development farther down the line. For now, the focus is on raising awareness and increasing consumer comfort within the broader umbrella of Middle Eastern cuisine. To create Middle Eastern inspired or influenced dishes, many of the ingredients that may be featured are familiar to consumers such as pistachios, chickpeas, couscous and tahini, and others may not be familiar, but are intuitive, such as rosewater and pomegranate molasses. Other ingredients can lend interest without pushing too hard against consumers’ comfort zones including preserved lemons, cardamom, sumac and hyssop, an aromatic herb with hints of mint, anise, thyme and rosemary. Add one or more of these flavors to create unexpected twists to more familiar sauces/dips, beverages, appetizers or entrées. 2. Spice Blends – The Middle East certainly didn’t invent spice blends but it has, arguably, elevated the concept to an art form. Spice blends from the Middle East range from dry blends to more pesto-style sauces, but all focus on flavor-rich ingredients that are well-balanced and impactful ingredients. Consider introducing dukkah, baharat, s’chug and za’atar as high-impact accents in shareables, burgers, tacos, wings, and more. 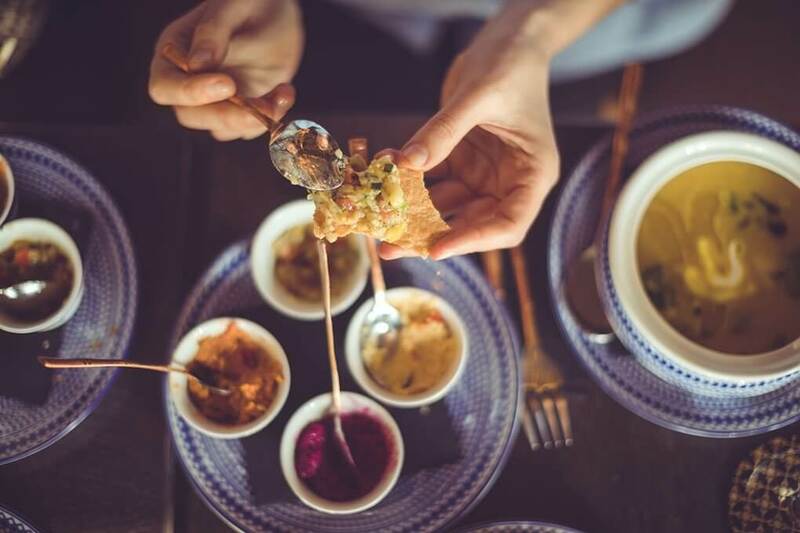 As with spice blends, the Middle East boasts fantastic spreads and dips that can offer operators a canvas upon which to innovate. Though hummus is the most familiar within this category, others include baba ganoush, muhammara, and kashke bademjan. In this era of interesting shareables, it’s a great time to dig into these flavorful, wholesome ingredients. Many consumers find it safest to experiment with beverages. In fact, many of the most innovative beverages to hit the U.S. market are from or inspired by international cuisines. To that end, consider limonana (mint lemonade, sometimes served frozen), qamar al-din (apricot juice or nectar-based beverage), leben (fermented milk beverage), salep (hot milk and cinnamon, thickened with salep flour), qishr (hot beverage made from coffee bean husks and ginger) and Turkish coffee. As nonalcoholic beverages hit their stride, any of these Middle Eastern options would create a compelling offering. Adding entire items from Middle Eastern cuisine may be a bit more daunting for some operators, with the viability of these driven by the degree to which its patrons experiment. Starting with the basics such as bread (barbari – thick Iranian flatbread), taboon/ laffa (flatbread cooked in a taboon oven), lavash (soft thin flatbread), markook/saj (very thin unleavened flatbread),) or cheese such as halloumi can begin to break the ice. Many other items may have unfamiliar names but have nothing truly unfamiliar to consumers such as khachapuri (cheese-filled bread), tahdig (crispy or scorched rice), tabbouleh (vegetable salad of parsley, tomatoes, mint, onion, and bulgar though other grains may be substituted), fatayer (meat pie made either with phyllo or dough), bourekas (crispy savory filled pastries) and moussaka (eggplant-based layered dish usually including ground meat). Here, the key is to focus on the familiar elements of these items to drive trial. Maeve Webster, President of Menu Matters, is a lead consultant for foodservice manufacturers and operators. She has spearheaded hundreds of major industry studies during her 16 years as a foodservice specialist, and today runs her private consultancy focused on helping manufacturers and operators analyze, understand, and leverage foodservice trends. Maeve Webster, President of Menu Matters, is a lead consultant for foodservice manufacturers and operators. Flavor Trifecta: Alan Skversky Alan Skversky is the corporate chef for San Francisco-based Boudin Bakery. We asked him to share a flavor trifecta that demonstrates creative, unexpected flavor play.